Portsmouth City Council has approved and finalised a loan to the Pompey Supporters' Trust (PST) which is looking to buy the stricken club. The Trust has been given a £1.45m bridging loan by the council which it will pay back at a rate of 5%. 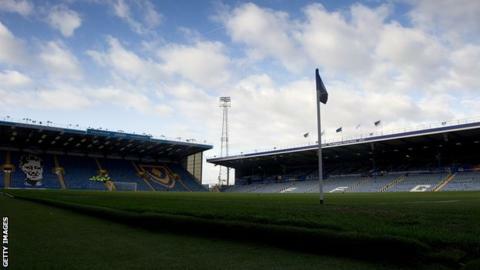 The loan will enable the Trust, along with property developer Stuart Robinson, to buy Fratton Park. Administrators of the club must first release former owner Portpin's hold on the club through the High Court. The decision to hand over the money was taken at an emergency meeting on Wednesday despite a last-minute appeal by Labour and Conservative leaders to council cabinet to delay the decision. Cllr Gerald Vernon Jackson said a decision had to be taken so administrators could file papers with the courts. "Without the money, the city would have been left with no professional football team and officers say the risk to council tax payers is now less than when the entire council voted to help out last August, " said Jackson. "The council has first call on the parachute payments from the league in August this year when the loan has to be repaid," he said. Portsmouth have been in administration since 17 February 2012. The club are currently the subject of a takeover bid by the PST, but approval is conditional on the group taking control of the club's Fratton Park stadium. Administrators PKF are attempting to force the sale of Fratton Park at the High Court and that case will be heard by 19 April at the latest.